The Grub Street Lodger: Pitching my Novel. I have just been to Foyle's bookshop to pitch my novel 'Death of a Dreamonger' to an agent as part of Curtis Brown Discovery Day. 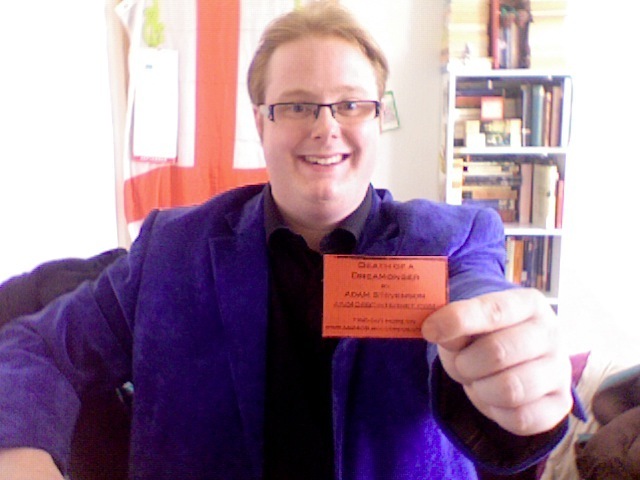 As you can see, I was all business with my bright blue jacket and red business cards. I was in the Wild Card Queue for those too feckless to have booked an appointment weeks in advance. Luckily, the people in the queue were a good chat, or I would have been bored and quietly bubbling into a pot of nerves. As it was I could happily breeze in and fairly clearly pitch the book to Anna Davis of Curtis Brown. She also read my first page and laughed at the punchline at the end. She described the writing as 'fun' 'snappy' 'lively' and with a 'spark'. She told me the central 'dreamonger' idea was 'clever', then 'very clever'. She gave me the impression that it was all good stuff. She also warned me that the genre bending (a comic thriller) and the gender bending (a male writing a book in a female first person) were difficult to market, and potential impossible blocks to finding a place for it. That said she told me to carry on giving it a good go, to certainly submit to Curtis Brown but to be prepared to lay the book aside and write another one that might be an easier sell. A sobering thought certainly, but not a depressing one. She didn't say the book definitely would not find its place in the world, and she was very encouraging about me and my writing, even if she saw difficulties in the book itself. I personally love Eve and her story and will not give up yet and take encouragement in this. I will pester my way onto a bookshelf eventually. I personally love a comedy thriller, books by Colin Bateman and Janet Evanovich are some of my favourites. I love Colin Bateman, and Christopher Brookemyre is good too. I think it's the presence of suicide that makes it harder.